Believe it or not, there was a time when “Rent” was radical. The musical, about a group of young New Yorkers fighting off gentrification in the shadow of the AIDS crisis, premiered off-Broadway, less than a decade after the country’s president would not even utter the word “AIDS” in public. Since its premiere, the show has proven to be impossibly popular, becoming one of the longest-running Broadway shows in history, touring around the globe, spawning a film adaption and training the exact number of minutes in a year into the memories of audiences everywhere. It’s a far cry from the show that initially attracted attention by talking about something the world refused to acknowledge. Now, in 2019—nearly 23 years after its Broadway debut—Fox’s “Rent Live” is here to prove the show still has a story worth telling. Though before the cast could even hit the stage, the production had to contend with a disaster. Brennin Hunt, who was cast as Roger, broke his ankle during the final dress rehearsal. Without an understudy, Fox eventually decided to forgo the live aspect of “Rent Live” and air back-up footage from the rehearsal. The last 15 minutes of the show were, however, broadcast live, and reworked to allow Hunt to remain seated. Starting in 2013, with NBC’s “The Sound of Music Live!,” these new era network TV live musical adaptations have generally produced mixed results, but they have uniformly lived and died on the excitement of them being broadcast straight from the soundstage. The absence of these stakes in “Rent Live” were unfortunately glaring. The issues that have come to plague the live TV musical were all exacerbated—shaky sound design, distracting lighting cues, less-than-perfect vocal performances—under the assumption that they could be fixed for the main event. It’s a shame, considering “Rent Live” was obviously created as a loving tribute to its source material. “Rent” has always been a work that’s endured despite its imperfections, because of its earnestness, and “Rent Live” is no exception. Fox’s production pulled from previous Broadway performances as well as the musical’s less-than-beloved 2005 film adaptation. There were, of course, unique changes made for this specific production, especially in terms of its staging choices. “Rent Live’s” take on “Seasons of Love” was especially endearing, and a clever departure from the cast standing in a straight line in which the number is usually performed. 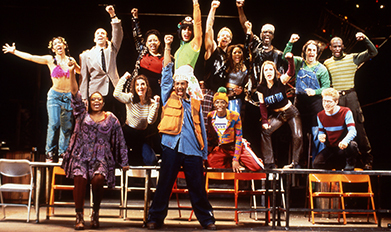 But for the most part, “Rent Live” seemed to function as a tribute to the legacy of the show and its storied past. “Rent Live’s” show-stopping finale even featured a reunion of the original Broadway cast reuniting onstage. Unfortunately, unlike most of the previous productions, it was obvious the cast of “Rent Live” was operating without the frantic energy injected from the knowledge of actually being live. Granted, these modern televised musicals often have to sell themselves to audiences with both marquee names in the world of film, music and television and Broadway performers more familiar with the type of production. It’s typically a strategy that ends up with a mixed bag of who does and does not thrive in the musical theater format, rehearsal or otherwise. Broadway veterans Jordan Fisher as Mark and Brandon Victor Dixon as Collins were the obvious standouts. Vanessa Hudgens, who previously stole scenes in Fox’s live version of “Grease,” also fared particularly well. However, singer Tinashe struggled to channel the grit necessary to play Mimi and lacked much palpable chemistry with Hunt’s Roger. But the most controversial performance of the night would belong to former “RuPaul’s Drag Race” contestant Valentina. Much like her run on “Drag Race,” where she gained both admiration and ire for her diva behavior, Valentina’s performance as Angel was divisive. She had charisma in spades but her vocal performance was shaky, to say the least. An especially pitchy high note during Angel’s solo in “Today 4 U” certainly did not help her case. Of course, she may have been saving her best vocals for the live performance that never happened, but this is, unfortunately, what aired. It’s a particularly egregious issue for a character meant to be a powerhouse, who serves as the center of attention every time she appears on stage and whose presence looms large even when she isn’t. But, love her or hate her, Valentina—much like her character Angel—was the most important part of “Rent Live.” She is a representative of the new queer economy, living evidence of the new structures that allow for previously sidelined performers to reach once untouchable heights in the entertainment industry. As a queer person of color, she is a result of everything “Rent Live” and its previous iterations have advocated for: inclusivity, opportunity, substantial representation. She is proof that “Rent” still has a place in the modern zeitgeist and has what it takes to retain its spot in the beloved musical theater canon. Despite its issues, whether or not they were a result of Fox deciding to air a dress rehearsal, “Rent Live” still nailed its most important moments. The most-anticipated numbers like “Seasons of Love,” “La Vie Boheme” or “Contact”—a sexually explicit number that is usually cut in censored productions, such as those regulated by the FCC and aired on network TV—hit all the necessary marks and were mostly successful. As frustrating as it was to watch much of “Rent Live” with the knowledge that the cast and crew were not knowingly producing the final product, the show’s final 15 minutes, the only footage to be broadcast live, was the most difficult. As the cast zipped across the stage, or in some cases, sat stationary aloft a table with an ankle wrapped in a plaster cast, to present the finale, the show’s potential became clear. The production was high-energy, committed, loving and heartfelt; the pent-up nerves from months of rehearsal reinventing this well-trodden story finally exploding on stage. It was everything “Rent Live” could have been, and everything that “Rent” always has been.